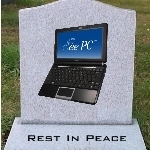 Charles Arthur at guardian.co.uk believes the announcement that Acer and Asus will stop manufacturing netbooks – marks the end of what was once considered ‘the future of computing’. 4. The iPad plus the attendant rise of tablets. …I think Arthur is a bit too reluctant to tie the whole story together and issue a blistering indictment against the netbook’s assassin. If you study the PC industry over the past five years, you find only one company that had the means, motive, and opportunity. Apple killed the netbook, more or less single-handedly, and we should all be grateful for it. When you consider the evidence, the culprit is clear: tablets and shifting consumer desires may have left netbooks in a critical state, but it was Windows 8 that killed the netbook off for good. Moore’s law is a cruel mistress indeed. Windows 8 has basically killed ALL pc sales…not only netbooks. If the netbook is dead, it is because of the availability of tablets with quad-core processors and detachable keyboards. Portability when you need it and notebook flexibility when you need a real keyboard.